What a way to write a column in the programme of the first ever match at Highbury, in September 1913. Optimism for the country would have been misplaced, for within a year the kingdom would be part of the most appalling loss of human life for the country of all time. 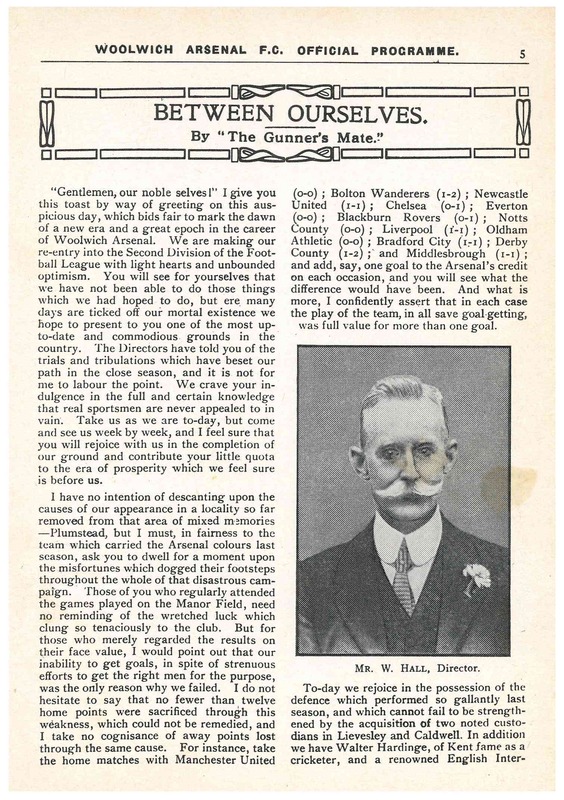 And yet for Arsenal the move to north London in 1913 was the start of a new world and a new life. 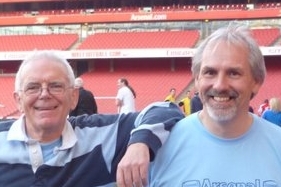 True, our first manager at the ground (then known simply as Gillespie Road), turned out to be something of a disaster on the pitch – although his memories would like us to believe otherwise. But still it all turned out right in the end, thanks not only to the incredible investment in the club by Messers Norris and Hall, but also to the decision which, as far as I can tell, was a Norris decision; to bring in Herbert Chapman. Yes… it does suddenly end there, and I will publish the next page shortly. I have simply found that if I try and publish both on one page then the page can load rather slowly. Gunners’ Mate started as a column in this Arsenal programme and was written then by a certain journalist called Allison who went on to become the manager of the club. George Allison was certainly able to write in an heroic style. Perhaps most interesting is the fact that the 1912/13 disaster, in which Arsenal got its worst ever record, is blamed largely on an injury crisis. Undoubtedly because Henry Norris was in north London sorting out the new ground, and because all finances were directed that way, there was no chance of buying in new players to shore up the team during the 1912/13 season. And I suspect that Norris didn’t really worry too much about relegation, for he guessed, rightly as it seemed, that the new ground in north London would fill up if the club was doing ok, no matter whether it was first or second division. He did not see relegation as a total disaster. So, here we go on the journey. Welcome to Division 2. Welcome to Highbury. I guess some things never change for tomorrow we start a new season with ‘Light Hearts and unboundedoptimism. With a touch of sadness at the way RVP has turned out. We don’t appear to have an Arseanl visionary on the board but there is none better than Arsene to manage the club. Thanks for these interesting windows of the past. We are all in your debt.